From a small beginning of half an acre, Wilsons Nurseries have grown Into a large business operating on more than 34 acres of splendid land in Pakowhai Road, where numerous glasshouses, shade-houses and packing sheds are erected, and many thousands of healthy, vigorous Roses, Fruit Trees and Shrubs of all descriptions are grown to supply an ever-increasing trade. Many new and rare plants have been added this season to our already large collection. We shall be pleased to advise clients in all matters relating to HORTICULTURE, and we extend a warm invitation to all those interested to visit the Nurseries. You can enjoy all these milk foods delivered fresh daily to your home. MILK PASTEURISED OR HOMOGENISED CREAM 9 VARIETIES OF DELICIOUS FRUIT OR FLAVOURED YOGHURT, COTTAGE CHEESE ALSO GRAPEFRUIT JUICE. 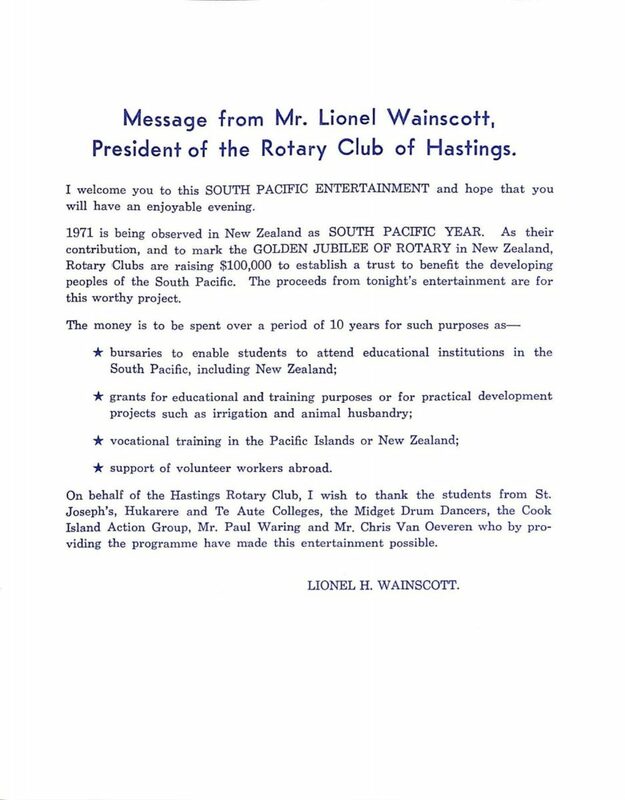 President of the Rotary Club of Hastings. I welcome you to this SOUTH PACIFIC ENTERTAINMENT and hope that you will have an enjoyable evening. 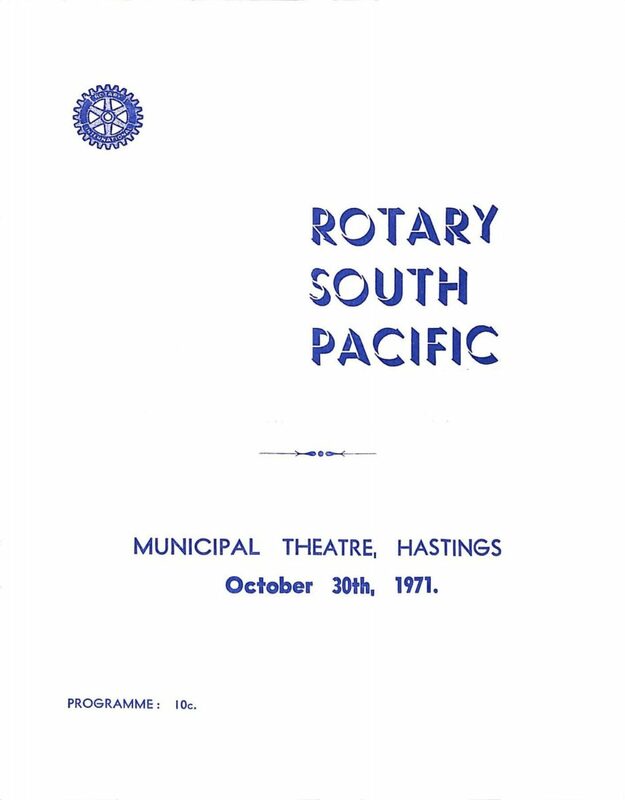 1971 is being observed in New Zealand as SOUTH PACIFIC YEAR. As their contribution, and to mark the GOLDEN JUBILEE OF ROTARY in New Zealand, Rotary Clubs are raising $100,000 to establish a trust to benefit the developing peoples of the South Pacific. The proceeds from tonight’s entertainment are for this worthy project. support of volunteer workers abroad. On behalf of the Hastings Rotary Club, I wish to thank the students from St. Joseph’s, Hukarere and Te Aute Colleges, the Midget Drum Dancers, the Cook Island Action Group, Mr. Paul Waring and Mr. Chris Van Oeveren who by providing the programme have made this entertainment possible. 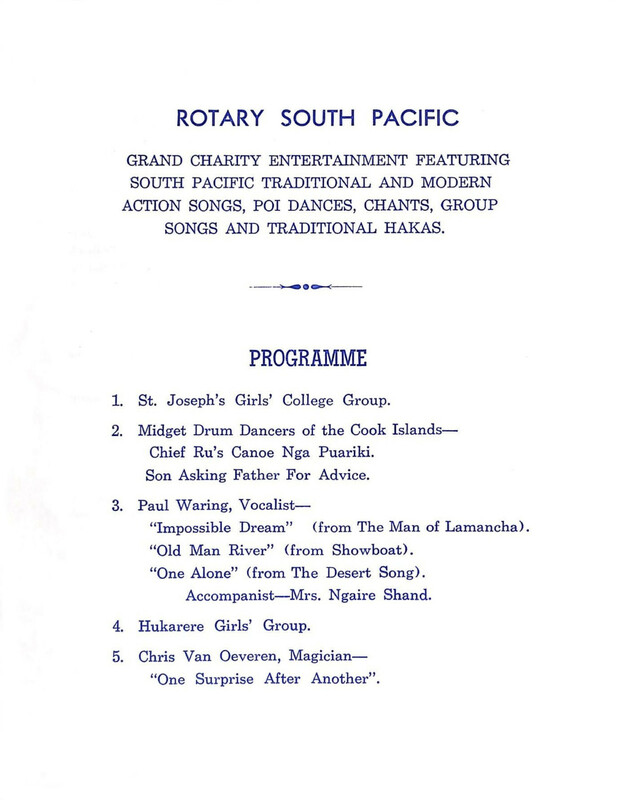 GRAND CHARITY ENTERTAINMENT FEATURING SOUTH PACIFIC TRADITIONAL AND MODERN ACTION SONGS, POI DANCES, CHANTS, GROUP SONGS AND TRADITIONAL HAKAS. 1. St. Joseph’s Girls’ College Group. Chief Ru’s Canoe Nga Puariki. Son Asking Father For Advice. “Old Man River” (from Showboat). “One Alone” (from The Desert Song). Accompanist – Mrs. Ngaire Shand. 6. 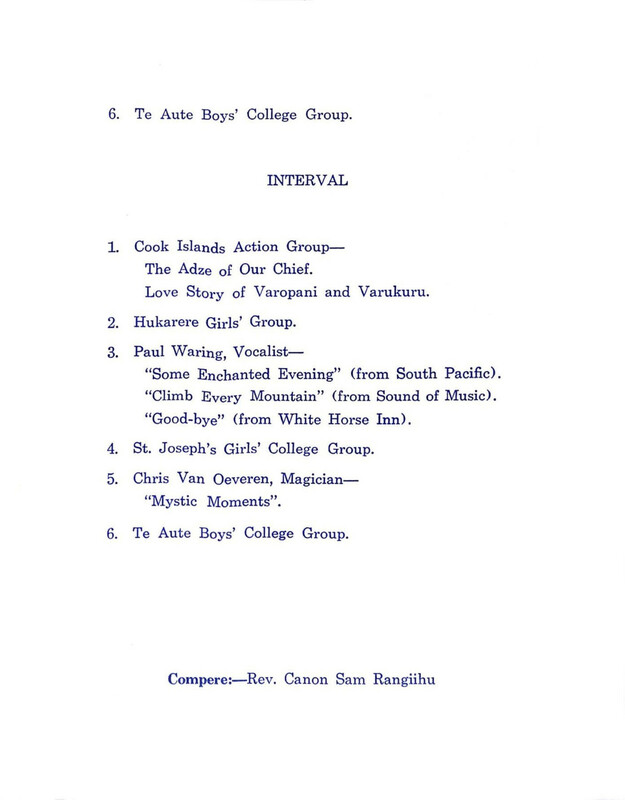 Te Aute Boys’ College Group. The Adze of Our Chief. Love Story of Varopani and Varukuru. “Some Enchanted Evening” (from South Pacific). “Climb Every Mountain” (from Sound of Music). “Good-bye” (from White Horse Inn). 4. St. Joseph’s Girls’ College Group. EXHIBITION STANDS; RUBBER STEREO CUTTING; SILK SCREEN PRINTING ON ALL MATERIALS AND SURFACES. POLYPROPYLENE SEAT AND BACK STACKING CHAIRS. WE WISH YOU ALL A VERY HAPPY EVENING. 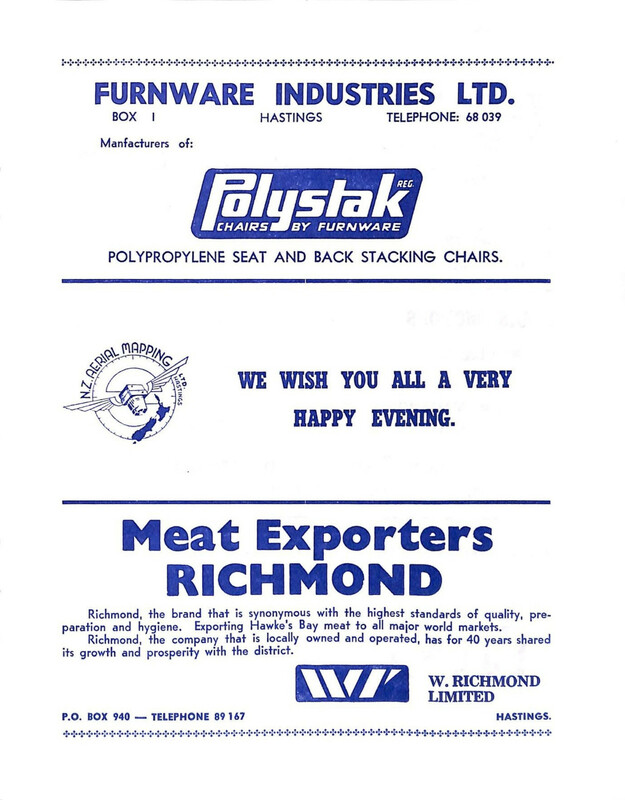 Richmond, the brand that is synonymous with the highest standards of quality, preparation and hygiene. Exporting Hawke’s Bay meat to all major world markets. Richmond, the company that is locally owned and operated, has for 40 years shared its growth and prosperity with the district. 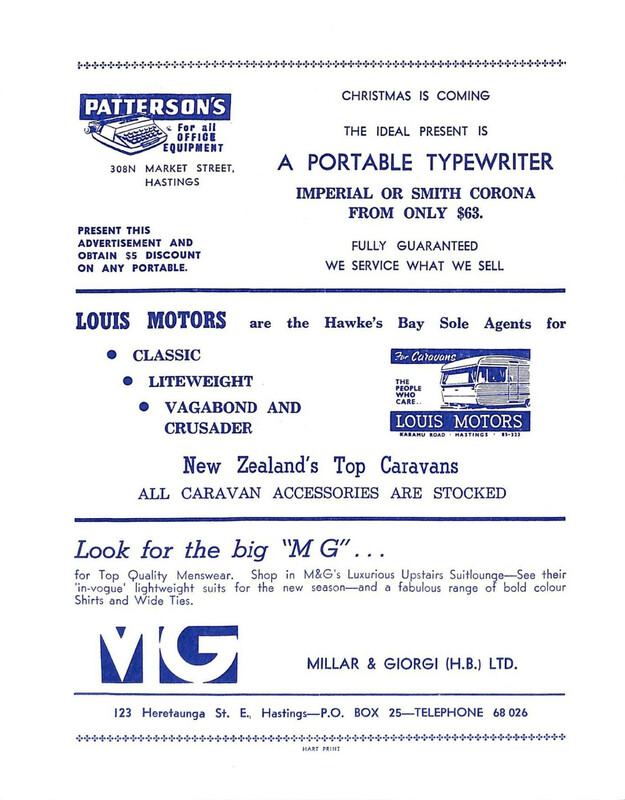 PRESENT THIS ADVERTISEMENT AND OBTAIN $5 DISCOUNT ON ANY PORTABLE. for Top Qualify Menswear. Shop in M & S’s Luxurious Upstairs Suitlounqe – See their ‘In-vogue’ lightweight suits for the new season – and a fabulous range of bold colour Shirts and Wide Ties. 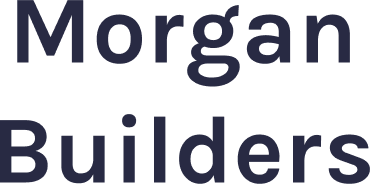 M G MILLAR & GIORGI (H.B.) LTD.
warm invitation to all those interested to visit the Nurseries. 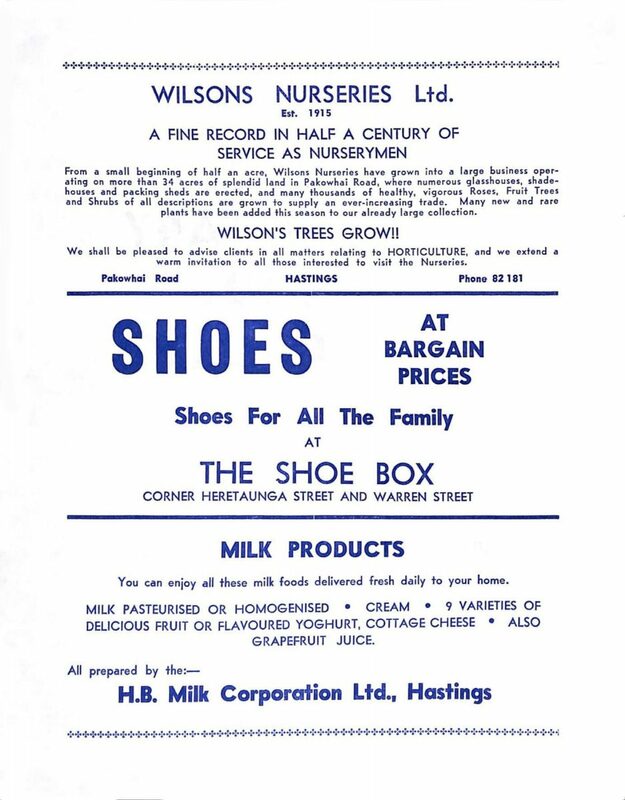 MILK PASTEURISED OR HOMOGENISED . CREAM . 9 VARIETIES OF DELICIOUS FRUIT OR FLAVOURED YOGHURT, COTTAGE CHEESE . ALSO GRAPEFRUIT JUICE. Message from Mr. Lionel Wainscott, President of the Rotary Club of Hastings. will have an enjoyable evening. 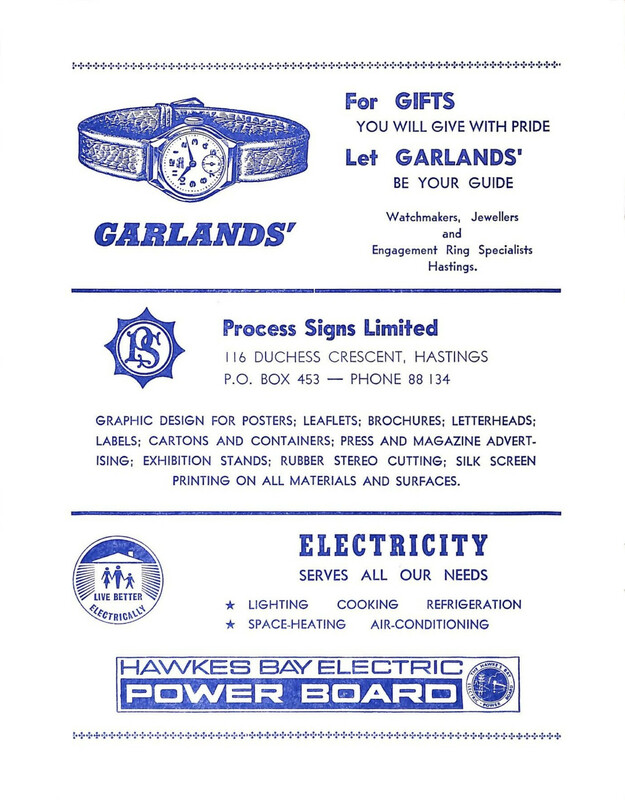 LABELS; CARTONS AND CONTAINERS; PRESS AND MAGAZINE ADVERTISING; EXHIBITION STANDS; RUBBER STEREO CUTTING; SILK SCREEN PRINTING ON ALL MATERIALS AND SURFACES.